Scott is an experienced workshop facilitator and a natural when it comes to public speaking. Is there a topic that affects you or perhaps people in your community? Scott offers several workshop topics that may interest you. From personalized hypnotherapy sessions to help you or community members stop smoking, lose weight, or build self-esteem, to learning how to deal with cyber-bullying, and drug and alcohol abuse. Or maybe you would be interested in learning how to start your own business? There are a lot of great ideas out there and Scott can show you how to tap into your business potential! There is also a Film and TV workshop that participants will find extremely fun and insightful. The goal of a workshop by Scott Ward is to open a window to many different opportunities! And these workshops are generally geared towards youth. So when you are looking for an MC to host your next event, hiring a well-known personality such as Scott Ward is a must! As a true professional, Scott’s business IS entertainment. 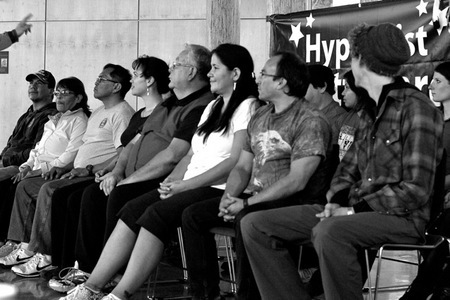 First Nations Love Scott Ward’s Hypnosis Shows and Workshops! !